Both devout Christians, the scandal has rocked the DUP to its foundations and raised questions over its potential impact on the north’s political process. It was also revealed today that Mrs Robinson obtained fifty thousand pounds from two property developers which was paid to her 19-year-old lover to help him launch a new cafe. According to the BBC, she later asked her lover -- named as Kirk McCambley, now 21 -- for five thousand pounds for herself. A BBC Spotlight documentary also said Mrs Robinson had lobbied on behalf of at least one of the property developers who supported her boyfriend’s project. It was also seen as no coincidence that Castlereagh Borough Council, on which Mrs Robinson serves as a councillor, recruited Mr McCambley to run a cafe at a new project on the banks of the River Lagan in Belfast. When the relationship came to an end, Mrs Robinson demanded that her lover repay the money, with 25,000 pounds going to her and the rest to be paid to a church in east Belfast, where her husband’s sister worked as a pastor. Last week Mrs Robinson, a Westminster MP, suddenly declared she was quitting politics because of a battle with depression amid increasing rumours and speculation. On Wednesday, Mr Robinson spoke publicly for the first time of his marital difficulties following several days of intense media speculation. In an emotional television interview, Mr Robinson revealed his wife, Iris, had an affair some 18 months ago and that the couple were trying to save their marriage. 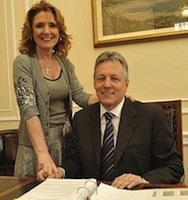 The DUP leader admitted his “immediate impulse” on hearing the news was to walk away from his marriage. “I felt betrayed after almost 40 years of being happily and closely bonded together,” he said. But he said he and his wife were determined to remain together. “I determined that I could not walk away without making a genuine effort to see if my marriage could be saved. That is the road I am on. It is a road without guarantees but it is not without hope. Mr Robinson pledged to continue in his role as First Minister, saying he would “continue to discharge those responsibilities without allowing his personal hurt to limit his endeavours. In a statement, Mrs Robinson detailed a long struggle with depression and said she tried to kill herself after confessing to her husband that she had an affair. She also admitted she encouraged friends to provide financial backing to assist the youth in a business plan. One funding source is understood to be Castlereagh borough council. “Everyone is paying a heavy price for my actions . . . . I am so, so sorry,” she said. Deputy First Minister Martin McGuinness said said no one watching Mr Robinson’s interview “could fail to be moved by the obvious hurt and pain being experienced by the Robinson family”.